Breakfast on the weekends is something as a family we have come to love! When we are all together it is a given mom will make a big breakfast one of the two days!! 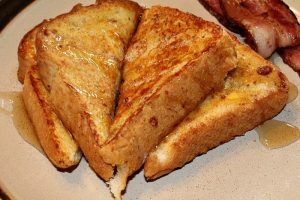 This time Kylie and her friends that stayed the night were begging for french toast, but I wanted to give it a twist so Orange French Toast is what was created! It’s no secret either that we love Simply Orange, last month we made Meatlovers Breakfast Casserole to pair with it, and that has now even been made for dinner!! But with it also being the New Year I am focusing on my health as well as my whole family’s health. Keeping drinks on hand when I am not feeling necessarily thirsty still, helps me to drink more. I don’t know about you but in the winter time I tend to drink less than other times of the year, and I know that isn’t good for me. Fresh fruit and vegetables is something I work hard to squeeze into our meals every opportunity that I get. I have a slight Safeway shopping problem and love to stock up there! Right now they have a great deal going (head on over -> here to see all products) buy $15 worth of products and get $4 off your next fresh cut fruit purchase! I love how easy these fruits make it to mix together and have a fresh fruit salad with our breakfast! I grabbed some extra drinks to have on hand, flavored drinks help me to enjoy hydrating more then just plain water. Once your griddle is ready to start to dip your bread in the batter and throw it on the griddle. Don’t allow the bread to sit in the mixture it will be to soggy if you do. Make more batter as you need. I added cinnamon after a couple dips. Serve by topping with cinnamon sugar and syrup!!! 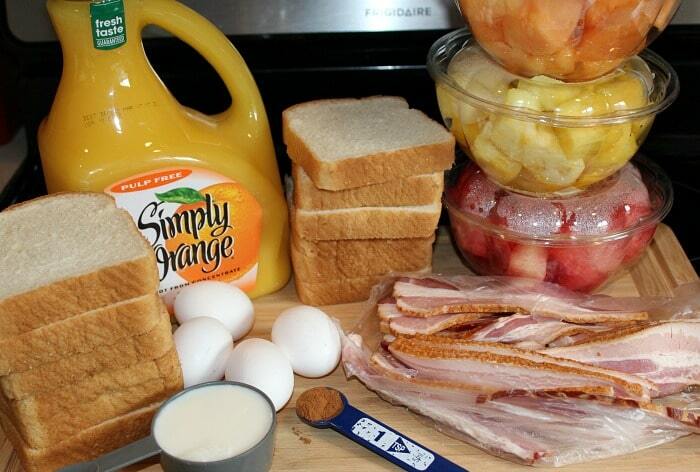 And of course don’t forget the fruit, orange juice, and bacon! How do you keep yourself hydrated during the New Year?? 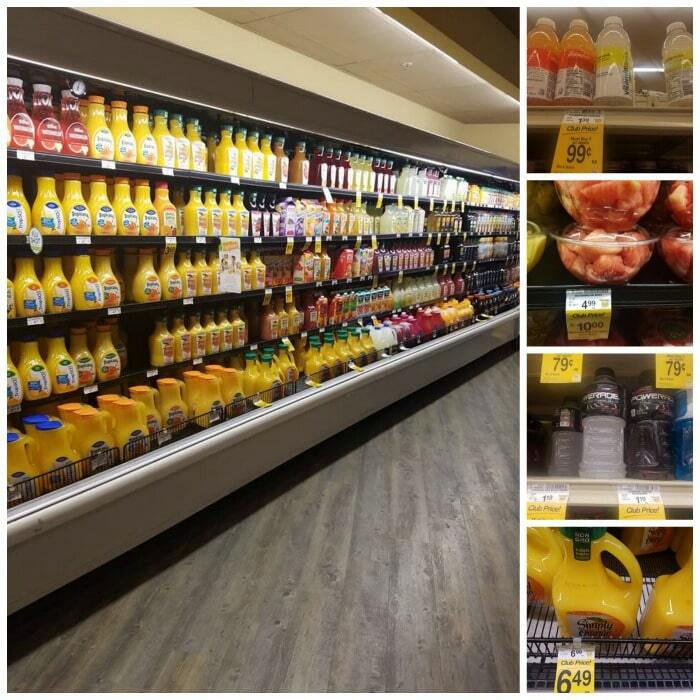 Head on over -> here to see the products included in Safeway’s buy $15 save $4 on fresh fruit! Once your griddle is ready to start to dip your bread in the batter and throw it on the griddle. Don't allow the bread to sit in the mixture it will be to soggy if you do. Serve by topping with cinnamon sugar and syrup!!! 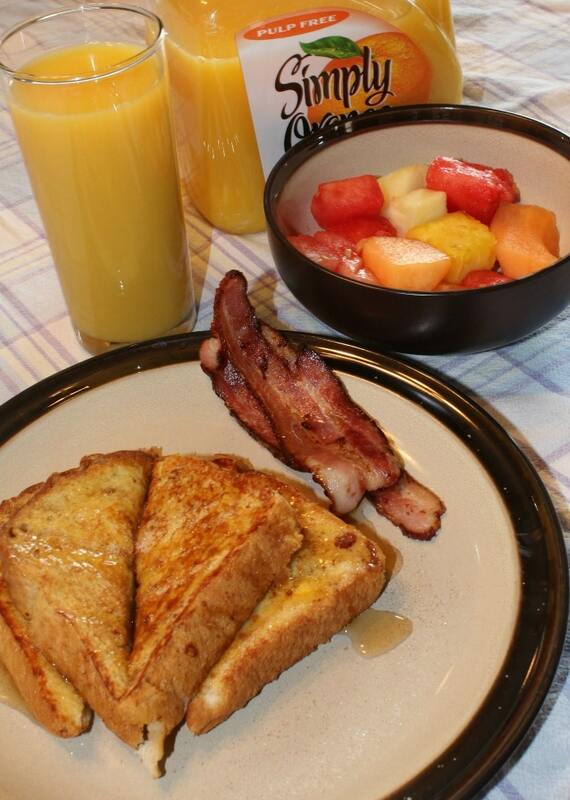 And of course don't forget the fruit, orange juice, and bacon! French toast is a favorite at our house. We like it for dinner too! Thanks for the recipe idea! 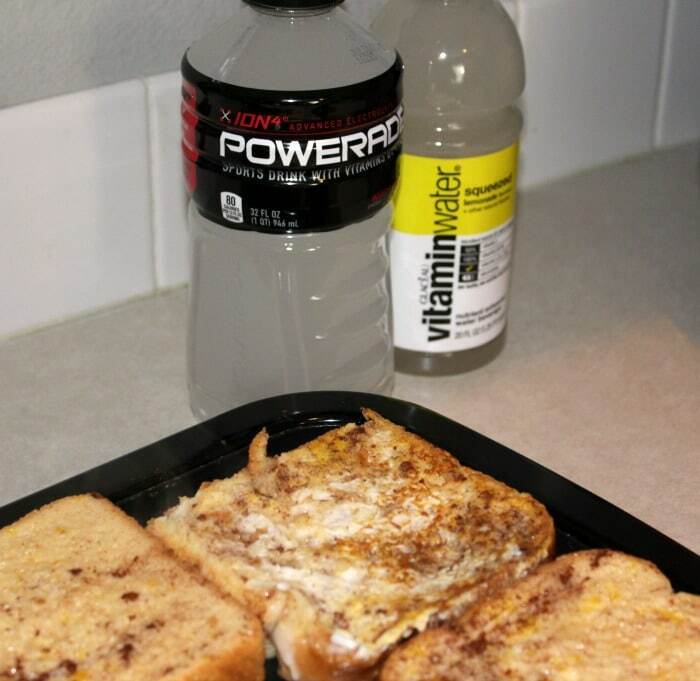 Thanks for the inspiration to get more creative with my French Toast. I am sure my family would love this. Yum! 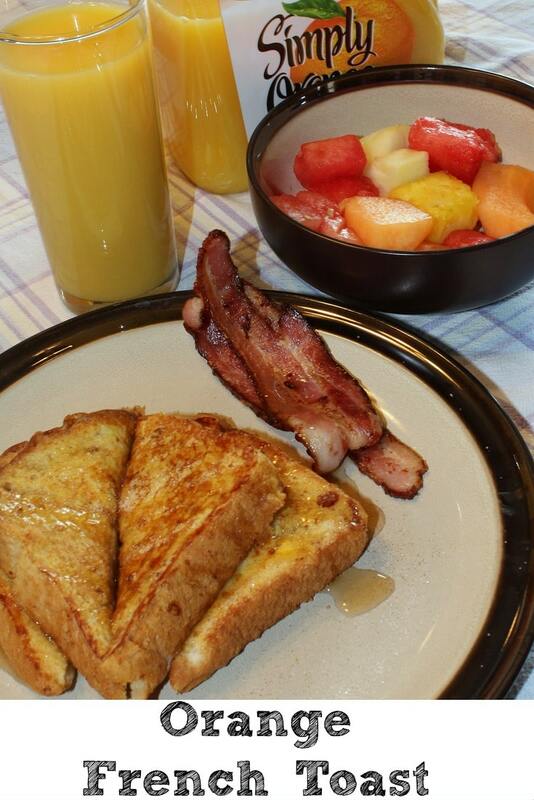 Citrus is always a tasty way to start the day, and I bet the orange adds a nice bright taste to the french toast. This looks so so so dang good!! I can’t wait to try this! I could eat this everyday it looks so good! 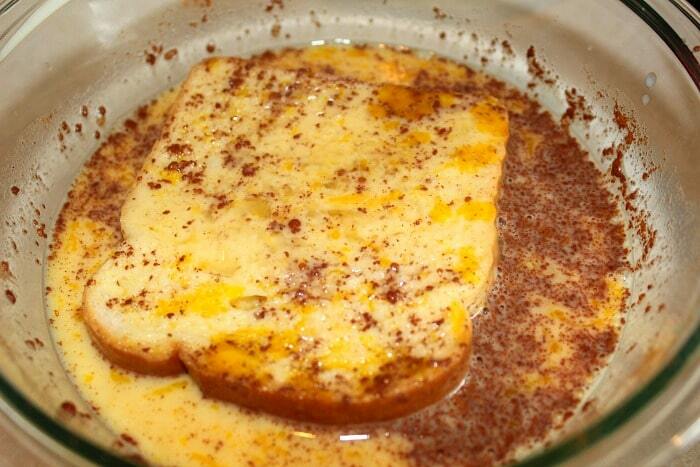 Your recipe for Orange French Toast sounds easy and delicious. I have made a recipe similar to this one. It is delicious!